Whilst it might be considered that the Karabakhi Armenians won the war to defend their right to live independently from Azerbaijan, they are losing some of the main, post-ceasefire, elements of “passive warfare”. 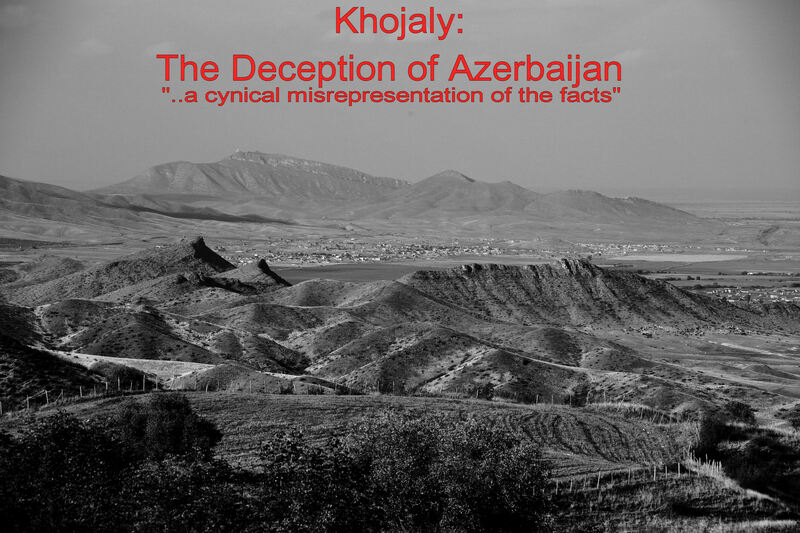 Azerbaijan is successfully winning the propaganda war and seems to have locked into the consciousness of those who know little about the conflict just 2 factors from history : Khojaly, and the 875,000 refugees, and IDP’s. They have managed to ignore and avoid the detail that complicates the real history of the war, and their supporters are not inclined to explore the facts beyond the packaged “stories” that the Azerbaijani Government wish to provide as the bait for their involvement. The act of fabricating a history, as compelling as the one that exists in the minds of the Azeri supporters, has subsumed much of the reality of the war , as well as the harsh facts about the present. One would think that the only people who died needlessly during that period lived in Khojaly, and that the only people displaced from their homes were Azeris living in Nagorno-Karabakh. Unfortunately very few people understand the background to this conflict to make an informed judgement or to hold a reasoned perspective. There are people who believe the Azeri propaganda that believe that the Nagorno-Karabakh war was started as a result of Armenian aggression against Azerbaijan; this is a version of history that bears little analysis. If, however, that was the case, then, what was the justification by Azerbaijan for putting a “noose” around Nagorno-Karabakh which, in 1991, was a part of their sovereign territory and then tightening it to the point of near-suffocation. It was in 1990 that the first signs of the rope being thrown around the Armenian enclave became evident with supplies and resources being gradually throttled back; the main artery back to the “homeland” through the Azeri controlled Lachin “corridor” was the “Achilles heel” for the stranded Armenians….and this was exploited by the Azeris. As 1991 progressed and Azerbaijan, in conjunction with the Soviet Army tightened the cord, through Operation Ring – the intimidation of the innocent villagers started in the outer regions, kidnapping, torturing them, and extorting them for personal financial gain. The second half of 1991 was a period of great turmoil. Azerbaijan was a fractured country with political divisions at the highest level, an unseemly collection of soldiers who had little direction, cohesion and discipline who were masquerading to the outside world as a national army. In September 1991, Armenia declared independence (shortly followed by Azerbaijan) from the Soviet Union which had started to collapse after the coup attempt, in August, against Gorbachev. Factions within the Azerbaijani armed forces clearly began to panic, and intensified their operations. From this time, the daily bombardment of the capital continued. It lies in the most vulnerable position, geographically, with Aghdam 15 miles to the East, Khojaly to the North and Shushi to the South. As the grip started to tighten, and the links to Armenia were confined to dangerous helicopter trips, the Azeris took another bold step. Following the crash in November 1991 of an Azeri helicopter containing 22 high-ranking officials, which was blamed on the Armenians, the Azeris shut off the gas pipeline to Armenia and the electricity supply to Stepanakert. As the citizens of Stepanakert entered the depths of winter, all major resources were blocked from them and living conditions were becoming unbearable and inhumane. The dissolution of the Soviet Union at the end of 1991 resulted in the distribution of vast quantities of military hardware to the independent republics, and much of it found its way in to the hands of the Azeri soldiers. This included the infamous BM-21 GRAD missiles which they positioned in Shushi and terrified the people of Stepanakert with the continuous storm of firepower from the banks of 40 launchers. The following video demonstrates the rate at which the 40 missiles are launched. Please watch this and consider whether the use of this weapon system can ever be morally right against a civilian population. People here are in their third month of life in the catacombs, and some are desperate. The full article “Life Goes Underground in a Capital Under Siege : Nagorno-Karabakh” can be read here. A video of the situation in Stepanakert in the early part of 1992, before May. “After each flight those helicopters which had brought flour and fuel to Nagorno-Karabakh, made the return flight evacuating women, the elderly, children and the sick. It was impossible to meet anyone just wandering around in Stepanakert. The city was living in basements, giving birth in basements, dying in basements. The lives of the injured were being saved in basements. Civilians, quick to learn the rhythms of war, soon discovered that it took soldiers 18 minutes to reload a Grad battery and would use those intervals to move around the city, or steal brief moments of normalcy. “I remember the mothers and fathers of the children you hear in the next room playing 18-minute-long football matches (during the siege),” Grigoryan says. In much the same way that the Bosnian Serbs terrorised and intimidated the people of Sarajevo, the Azerbaijani’s were doing the same with the civilians of Stepanakert. The relentless bombing of the capital had no precision, or strategic military objective, it was simply to destroy as much of the city as possible, without any care as to how many people were killed. Stepanakert was surrounded, there was no humanitarian corridor through to Armenia, no provisions for their safe evacuation. This contravened the provisions of the Fourth Geneva Convention as well as other established norms of war which protect the rights of non-combatants. The following video is a well-documented summary of conditions in Stepanakert in February 1992, and the background to the events in Khojaly. 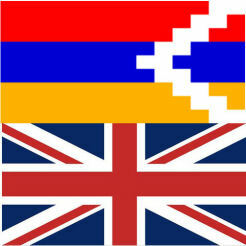 The Karabakhi Defence forces needed to take action to save the lives of the people in Stepanakert. This was the direct motivation for the taking of Khojaly, and the airport, as well as the Liberation of Shushi on 9th May 1992. Shortly after the Armenians took Shushi, the Lachin Corridor which opened a route back to Armenia, was finally opened which gave some respite for the people of Nagorno-Karabakh. This was only to last for a few months, when the Azeris started their aerial bombing campaign. “Azerbaijan’s air force bombed the capital of the ethnic Armenian enclave of Nagorno-Karabakh on Saturday destroying a hostel for refugees and killing at least 10 people, according to media reports. A spokesman for Nagorno-Karabakh’s regional legislature said two Sukhoi-25 bombers attacked Stepanakert with 1100 pound shells hitting the hostel and killing “dozens” of people. This was the start, but it was not an isolated attack. The bombing raids continued for the next year until finally the Armenians took Aghdam; this ended the aerial attacks on Stepanakert. It was only at this point could the citizens of this city be assured that they would not be subject to military firepower. It would still be another 10 months before the formal cease fire was declared. A siege is often considered to be, principally, a military confrontation, however a siege can be any attempt by one party to force the surrender of the other party by blocking off access to resources, by encirclement. It has been very slow progress for Stepanakert, as well as all parts of Nagorno-Karabakh to recover from the war, and the continuing unrecognised status severely impedes opportunities for it to grow through direct trade, internationally, and to secure inwards investment from people outside of the Armenian Diaspora community. Physical access to external resources is limited to the single road back to Armenia via the Lachin Corridor. Due to its condition, it maintains a throttling effect, on the flow of people, resources, and investment, and in the event of a bad winter, would close traffic off completely. The continued threat to shoot down civilian planes that fly into Stepanakert airport is another key element of the on-going siege. Whilst the aircraft that are licenced to use the facilities are small passenger craft, the opportunities for people to easily visit from Yerevan, is frustrated. The intimidation offered by the threat reinforces the view in the minds of those who are unsure, that the military conflict is still present and therefore still a dangerous place to visit, and to do business with. But the most insidious, and menacing, behaviour from Azerbaijan, which speaks loudly about their mentality, is the obscene levels of military hardware building up east of the Line of Contact. Whilst they may accept that they were a dis-united and chaotic force in the early 90’s, the mirage of unity through this show of weaponry and mis-use of public money is an extreme vanity project for Aliyev, and the Azerbaijani authorities. It is just as much about him maintaining power as it is about asserting territorial ambitions on behalf of the people. For the people of Stepanakert, who have seen their city being rebuilt over the last 20 years to one that is starting to be fit to be the capital of an independent state, they remain sanguine, and optimistic. For the youth, they will not know any different than this curious “twilight world” of non-recognition, continuing threats from an adversial, aggressive neighbour, difficult living conditions, low salaries, intermittent water, poor services, and general stagnation. 20 years of this permates the soul of everyone, and engenders a short-termist perspective; planning for the future is an intellectual luxury available to few. The “18 minutes” that Irina Grigoryan recalls between GRAD launches in 1992 has now expanded into years, but the fear, deep within the sub-consciousness, about “when the next bomb will drop” is affecting everyone’s lives. The parents will unwittingly pass it on, even to those who were not born at the time of the ceasefire. The siege of Stepanakert continues until this day, and drives a “siege mentality” in many people that is depressing to them. It is almost impossible for anyone outside of this country to feel, and understand this, but it is the consequence of indifference to solving an awkward conflict, and the unsavoury ingratiation given to Azerbaijan by the governments of “the West” that makes them complicit in prolonging this siege. © Russell Pollard – http://www.Artsakh.Org.UK, 2011-2013. Unauthorized use and/or duplication of this material without express and written permission from this blog’s author and/or owner is strictly prohibited. 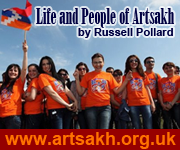 Brief excerpts and links may be used, provided that full and clear credit is given to Russell Pollard and http://www.Artsakh.Org.UK with appropriate and specific direction to the original content.